I caught hold of the prepping bug and began to put a BOB together three years ago. At first the bag was just a black back pack I found in our closet which I slowly stocked with the gear I believed that I needed. I started purchasing items a little at a time from places like Walmart as I did not have funds to buy the name brand high end gear I desired. You can actually obtain some fairly good items/gear from the mega marts fairly inexpensively however. The Maglite, Energizer WeatherReady crank LED flashlight and Buck 110 folding knife are the best name brand buys I scored from Walmart. Another excellent way to get great deals on your gear is to make purchases through Amazon. If you pay attention and place only the items that offer free shipping at Amazon in your cart you can have an entire order ship for free. I had an order for gear that totaled over a hundred dollars which shipped for free. The BOB pictured above is my current configuration of gear and bags. I say current because as I mentioned in part 1 of this post BOB’s tend to evolve over time or carry on as a work in progress. Some individuals even change up there BOB’s gear with the change of seasons. I chose a Maxpedition Sabercat VersiPack in olive drab as my BOB and later added the Condor H2O bottle pouch in order to carry all of my gear. The H2O pouch carries my two pots, water bottle, Leatherman Wave multi-tool, emergency blanket, some paracord and a magnesium bar. For day hikes I split off and carry my H2O pouch with gear inside and have the basic survival equipment needed in an emergency. The picture below shows all of my gear with the exception of my tarp and sleeping gear. My BOB is kept in the vehicle I drive and there is also another different one in the vehicle my wife drives. Our two daughters that are still at home with us each have a 72 hour kit that I am continuing to build on as well. If you are new to prepping or are just getting started with a BOB, or 72 hour kit hang in there and build on it a little at a time. Before long you will have a fully functional BOB with the gear you need. We would like to feature your article so more people could benefit from your knowledge. I would be honored to have a site of your caliber feature my article, please feature it. The Homestead Survival site is an awesome source for inspiration and information. I may write a post on my kids bug out bags in the future. My daughters are 11 and 16 so I have some of the same items in there bag as is in ours but not nearly as much as my kit due to the weight and the fact they will most likely be with us in the event of an emergency. As my older daughter transitions out of the home in a couple years I will beef up her BOB. That is a good idea having your 2 year olds food and water in your bags. I have not researched BOB’s for younger children however an idea may be to have a specific bag for your child with items to entertain and comfort him/her. You may want to include items like a special blanket, a few books, toys, medicine, tooth gel for pain, diapers (if needed) and a change of clothes and such. I hope this helps and thank you for viewing my site and for your comment. I’m curious about the Altoids tins. Do you really have Altoids in there or is it something else? The Altoids tin does not have any Altoids in it. The contents inside of it make up my Altoids survival tin which includes very small items such as a lighter, flashlight, candle, fishing line, fish hook, lead weights, signal mirror and many more such items. There are many post and videos and reviews of individuals Altoid tin survival kits on the internet. Thank you for asking. I will post a description of my Altoid survival tin in the near future. Feel free to subscribe to my blog site so you do not miss it. What would you do with all that stuff? How would you use it? The majority of the items have multiple purposes or may be used at any time if needed. An example would be the Leatherman Wave multi-tool may be needed to tighten a screw on a pair of eye glasses, or to cut a seatbelt to free someone in an accident. My wife and I used two of the flashlights out of my pack for an unplanned hike into the Ape cave in Washington. My BOB is always in the vehicle so it was just a matter of getting the flashlights out. Had my bag not been in the vehicle we would not have been able to explore the cave. Having a kit in your vehicle allows you to be prepared for anything you may need on a daily basis as well as the overall kit for an emergency or disaster lasting many days. Thank you for your questions. I value your opinion as you believe it is worthless to you; however keep in mind it may be of value to others. It sounds like you may have more experience than myself if you believe the list is worthless, perhaps you could share what you believe to be the best items for a BOB. The post was not intended to give sizes and specifics of each item in the bag. 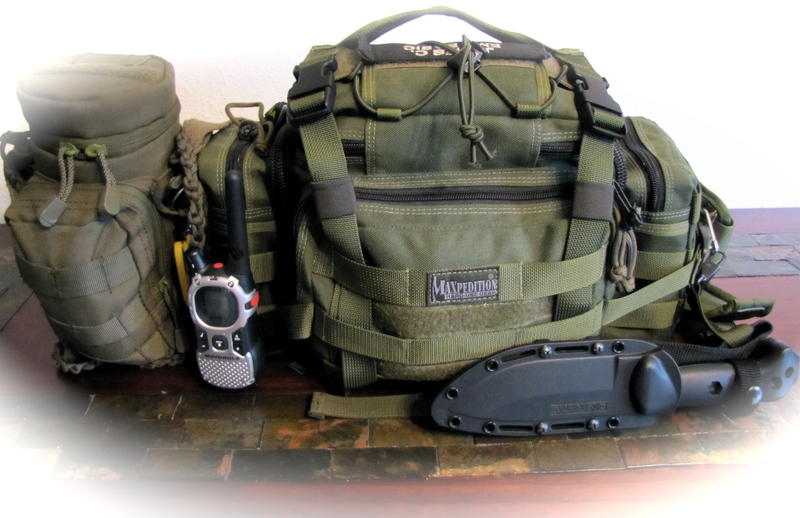 Detailed information regarding the Maxpedition Sabercat Versipack is available all over the internet. For your convenience I have included a link to Equipment To Endures youtube video review of the bag below. I’m not really sure why you chose the words you did so I won’t presume….too much. The point of this post, as I took it, was to set a general guideline as to the poster’s choices. If you are, as he said, more experienced in the area then surely you jave a bag of your own and would like to share your insight. If you are not more experienced in the area then perhaps you could use his example as a starting point for building your own. Regardless, I hope that you will come to learn that what is a good bag for one may not necessarily be a good bag for another. For example, I don’t recall a mention of a sidearm. A bag for my family and me is not complete without my Glock. I saw no reason for judgement here. Is there somewhere on here that I could download this info in RTF, DOC, or PDF? Are you requesting a Doc or PDF copy of the article? I have always worried about eating food stored in a car due to excessive heat, how often do you switch out the food? Have you not put a tent in because this is in a car using it as shelter? I ask because I have the military poncho with grommets, emergency blankets, extra clothing, a small tarp, and I still include a one person small tent! I have been concerned about eating some food due to the high and low temperatures in the vehicle through the seasons as well. I did have items such as the mylar packs of tuna and salmon in my pack originally however have taken them out due to what I perceive as a risk. Instead I packed food less susceptible to the temperature changes such as rices, oatmeal, and freeze dried foods. I switch out the food with the expiration dates. I do not have a tent however that is a good item to have. I have a standard tarp in my vehicle and have the material to make myself a light weight water proof silnylon 8 x 10 tarp tent to replace it with but have yet to do so. Thank you for your input and questions. Hi, I have an ecommerce store still in it’s infancy stage. I am in the process of building a webpage but have started with a Facebook page. I found your blog through The Homestead Survival page above, which I love and promote every chance I get. Your bag looks great. Very thorough and well thought out. I love how you stress the “start/grow/adapt mentality”. If your bag doesn’t evolve you really aren’t giving it enough thought (at least that is my philosophy). I am curious as to the weight of your bag. Do you follow the 1/3 body weight rule of thumb? I have children ranging in ages from 8 – adult age. Each of their bags has their bags and sime essentials as well as sharing the “group load” appropriate to each child’s size and ability to ruck. For example, my 8 year old has her clothes and the toiletries for the group, my wifes has her essentials plus the lighter food supplies for the group. Mine has the heavier items (cooking supplies, tarp, etc) as well as my individual supplies. Each bag has at least some food while not exceeding the 1/3 rule for the individual. Keep up the good work. It is important. Hello and thank you, I am glad you found my post. I to am promoting Homestead Survival whenever I can as they are an awesome source for information. I have spent a lot of time on my bag over the last couple of years reworking it and changing it up. Seems we are on the same page regarding the bags evolving. My bag is currently about 25 pounds and honestly I was not aware of the 1/3 body weight rule of thumb however I did not want my bag to be over 25 pounds if possible. That is awesome how your family shares the groups overall load that is a great idea. Good luck with your store and thanks again for commenting on my post. I love seeing what other people put in their BOB’s. Everyone’s seem to be mostly the same, but it is where they differ that interests me most. I would suggest the military one’s instead of the walmart camping meals. Also, did you build your bag randomly as you were able to obtain things, or did you focus on one specific need (shelter, food, water, fire, etc.) at a time to make sure you didn’t overlook something? I too like to see other individuals BOB’s as it seems no two are exactly the same. Thanks for asking about the MRE’s, I am not opposed to packing them in the bag. I went with the current meals for a couple reasons one of them being that they fit in my bag. The other reason being they were on sale and I got a good deal on them. How big are MRE’s and where can you buy them? I built my bag as I was able to obtain the items over time however I continually evaluated my list of items desired and revamped it as needed. Thank you for your comment. My thoughts on the military MREs is that, while convenient and complete are usually a little pricey for my budget. I really like the idea of the Knorr (or Lipton as some are still labeled) pasta/rice dishes, especially the ones not requiring milk (although powdered milk will substitute). I did find, from another blog (I’ve forgotten which one now or I would credit it) an economical method for putting together a “poor man’s MRE” as it were. Hormel Compleats (http://www.hormelfoods.com/brands/hormel/HormelCompleats.aspx) have a long shelf life (2 years if you can find them early enough), they are microwavable (not all home situations involve loss of electricity), can be boiled in the package (convenient for campfire situations), or can be eaten cold as is (they are completely cooked). Best of all, they taste good. You can pick them up for a decent price ($1.20 – $2.50 per meal) so you can have plenty on hand. At 10 oz per meal they don’t add a large amount of weight to your pack. I’ve gotten in the habit of keeping the little silverware packets that come with take out. Some have durable utensils and salt/pepper packets. Regarding the MRE’s I believe they are higher priced as well and I do not believe they would fit in my pack as well as the Mountain House meals I currently have. The Knorr/Lipton meals especially the rice based ones are what I rely on at this time. Thank you for the information on the Hormel Compleats and the MRE info link I will look into them. I like to collect plastic silverware from fast food or other places too. Another thing I pickup is hot sauce, mustard and other condiment packets. Thank you for your comment. Thank you! Going to get started on this! Your welcome and thank you for reading my post. I was just wondering, I see no first aid in the kit. Did you plan on adding that or are you just omitting this for the bag in the car? Even if you have to walk a long distance you would at least need some band-aids. Just a thought.So many knives and no bandages. Sorry about the last post. Just saw the first aid kit listed. OOPS! No problem, I like to keep as well rounded of a kit as I can. I am continuously updating/revising it. Feel free to give any suggestions you may have. matter, your site came up, it seems to be good. I’ve bookmarked it in my google bookmarks. Thank you for checking out my blog and bookmarking it. Check back often I will be posting more articles soon. I hope to help as many people become prepared as possible so thank you. 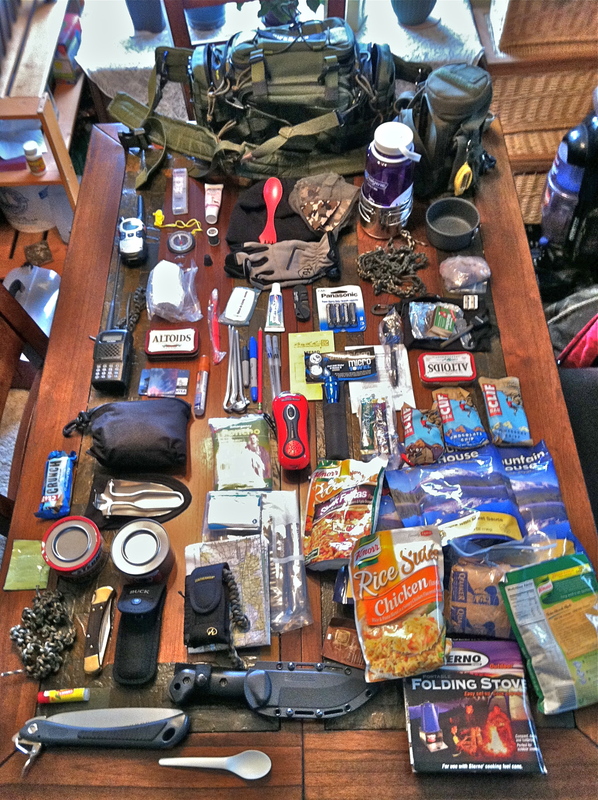 In 72 Hour Kits and Survival Bags Part 2 | Self Reliance … I find many things. Today: Monday! I go back for 72 Hour Kits and Survival Bags Part 2 | Self Reliance …. Thanks! Hey, so I am brand new to starting a bag. I have been thinking about it for years but have never really done much to get one together but I figured since I live on the gulf coast and hurricane season is coming up its time to put one together. My family thinks it’s kinda stupid but as a single female I figure when it comes down to it the only person I will have to rely on will be me. I haven’t a few things like a multi tool, a can opener, a tarp, a flash light, and a LED lantern(given to me by my job for Christmas). What do you think should be the first few items I should focus on. Hi there, now is definitely the time to start since it sounds like you are ready to build your survival kit. Don’t worry about what your family or anyone else thinks. You will be the one prepared and they will not and your right ultimately we need to rely on ourselves as we really can not gamble relying on others. So your off to a good start with what you do already have, the tarp for shelter/cover, the flashlight, lantern and multi tool. Keep the rule of threes in mind when building your kit. Three minutes without air, three hours exposed/without shelter, three days without water and 3 weeks without food. I recommend building a fire kit with a lighter, waterproof matches, magnesium bar, fire steel, jute twine, candle(s) dryer lint and vaseline soaked cotton balls. Purchase some cordage such as 550 paracord for tying out your shelter and many many other uses, see youtube videos for all of its uses. Get a wool or other blanket. Buy a good survival/bushcraft knife for shelter construction and bush crafting. Make sure you obtain some water purification tablets, an emergency water filter and water container such as a Nalgene bottle and pot for cooking/boiling water. Get a NOAH weather radio so you can keep updated of the weather/storms. Put together 72 hours of food and medications/vitamins. And put together a small first aid kit or buy a ready made one. You don’t have to spend a lot on a bag just use an old backpack in the beginning. This is by no means a complete list or recommendation, your kit can grow as you learn more about preparedness and survival. Best wishes to you on your preparedness journey and thank you for viewing my site and for your inquiry. Comment for Jennifer: We went 15 days without electricity after Hurricane Ike hit Galveston. We were in far north Houston, appx. 50 miles from coast, so we did not need to evacuate. We did have two houseguest and their cat for 4 days, until they were allowed to go back home. What floored me was the helpless people lining up for water, free meals, ice, etc. We knew it was coming four or five days in advance, yet they did not even have a jar of peanut butter and a box of crackers. There were people commenting on TV news that they didn’t realize gas stations and McDonald’s and Starbucks would be closed. Businesses got their electricity on before we did, but we had plenty of food, a generator, gas to go in it and an attitude of self reliance. Our biggest inconvenience was heat and humidity with no air conditioning. We did not run the generator 24/7, so we did eventually lose the meat in the freezer. It’s not that hard to be prepared, it just takes time and effort that some people are not willing to give. Notice no firearm….. Even a air pistol is better then nothing. If this was brought up in other replies sorry for repeating. Yes you are correct no fire arm in my bug out bag. I chose not to include one in my bag. I instead have chosen to carry it on me and it will be added to the overall ensemble when needed. I agree that anything even an air gun is better than nothing. Thank you for your input. What about those drinking straws that filter out bacteria and other harmful things? Are they worth the investment? That is a very good question. While I am no expert on the filter straws my belief is that they are worth the investment for short term use. The one I have is good for about 20 gallons of water through it. And the intent of my purchase was to have it for hiking and back packing as a backup clean water source. It can also be used in emergencies initially until I am set up to filter or boil water. In my opinion they are great for short term or emergency use only not long term. Thank you for your question. Hi, I don’t think I saw an extra pair of shoes on your list. I think for a lot of us (especially women and kids) we wear flip flops and sandals a lot and this could be a real problem in a disaster. This summer I added shoes for each of my kids to our stores in the car. I also think a nice supply of plastic grocery bags is a great idea. They can be compressed really small, they are free and they can be used for all sorts of things including making your shoes waterproof for short periods of time. This would at least allow you to get out of your car in the snow to go to the bathroom and keep your feet dry. Great list! I appreciate it. Hi Pam. Very good advise concerning shoes and you are right. We never know what shoes we may have on or sandals in some cases when we are challenged. I make it a priority to have at least a pair of tennis shoes in my vehicle. My preference is my hiking boots and whenever I go further than 15 miles or so from my house I make sure I have them with me. The plastics grocery bags are very useful I agree. I have actually used them to keep my shoes dry in snow before. That is something I will be adding to my 72 hour kit/BOB. That is great that you have supplies including shoes for each family member in your car. Thank you. Happy to see for once: No Guns! Thank you for your comment and checking out my blog. Hi Tony. Thank you for the compliment. I put a lot of time and thought into my various bags that I put together whether a BOB, GHB or EDC. I agree that a lot of people tend to focus on the hardware/gear and do not seem to include much if any food or water. I had designed the BOB in this post to be a true 72 hour kit with the 72 hours based on the food and water. The BOB in this post has morphed over time and now the gear with some new pieces reside in a Kelty Coyote 80 back pack. I needed a larger pack since I had bought and included a two person backpacking tent as my shelter. Your EDC/GHB sounds like it is very thorough and I would love to see pictures or learn of its contents. Thank you for the link to the information regarding tuna subjected to high temperatures. The information is very good to know and will be a benefit to all who check it out. As far as posting a picture in this thread I am not sure exactly how that is done as a comment. You could try to copy and paste the pictures into the comment/reply and see if that works. If that does not work let me know and we may be able to figure something else out. Thanks again Tony. I completely understand that bug out bags are a matter of opinion based on the person bugging out and what they deem necessary, but I’ve noticed a trend that I’m not entirely happy about. People seem to have completely forgotten that they are bugging out for 72 hours. You’re not going glamping. Your article here pushed me over the top and I have decided that perhaps it’s high time for me to start a blog about why a person doesn’t need all sorts of repetitive gear to bug out for a few days. I too have a 72 hour bag, but it contains 1/10th of the gear you have in yours. Holy smokes, Batman! If I had that much food I could survive for a couple weeks, yet you lack enough water. 4 flashlights? Where you going to fish? Work gloves for what? How many fire starters you need? Notepad? What kind of notes you going to take? What you planning on digging up with your shovel? Point is, you fell into the gear trap. Take your knife, Nalgene and the cliff bars and peace out for 72 hours. You’ll make it to your bug out location. I promise. If you don’t have a location to reach then stay home. You’re at your bug out location already and don’t even know it. Unless you murdered somebody. Then by all means, BUG OUT NOW!!! Hi David, sounds like you understand as stated that bug out bags are a matter of opinion. First I may remind you that there really is no such thing as a perfect bug out bag nor 72 hour kit for anyone. In regards to your first concern of redundancy in gear take a look at blogs and videos from some of the top and celebrity survivalist many of them preach or teach to have some redundancies such as multiple ways to make fire. Remember one is none and two is one, in the event the first way is lost or broken. There are thousands of people who have built bags and each one is different. I believe that my bag will never be perfected nor will anyone else’s. My 72 hour/BOB has morphed several times since its posting. I believe that my current set up is the best one so far and through trial and error I have got it to the point it is at now. You are only partly right in your judgement of my 72 hour bag/BOB in my opinion. My bag is not a traditional 72 hour bag. I designed it only with the first 72 hours in mind for food and with water options planned in. My bag is a hybrid 72 hour/ Bug Out Bag. The first 72 hours are to ensure I have good food and adequate energy to setup a base camp and secure fire wood in the first 72 hours. This bag would be used in the event bugging in is not safe and the best option is to head out of town. The rest of the batman gear as you stated is meant to last long term and get me through day to day use for an undetermined time not just 72 hours. So you may be slightly right in the fact that the gear that I had in the bag within this posting may have been too much gear for just a 72 hour kit to see you through just those 72 hours. As far as bugging in, in some scenarios that may be the best option. However likewise in some scenarios that may not be the safest nor best option as there are many variables involved in either case. Thank you for your opinion and good luck with your blog. That is a very good good point, I agree they may be invaluable. I actually have a few inside of my altoids survival tin. I am glad you brought it up so that others may read this and add some to their gear. Good article. And as you say each bag will be different and conform to whatever each personalities/requirements would be. Being a firefighter/medic for 35 years, I look at things as others, from a little different perspective. I have included a box of sanitary napkins, tampons, medical tape and a couple of triangular bandages with the idea that during that first 72 hrs, there will be a lot of confusion, adjustment to altered conditions, and with a few, abnormal actions in prepping your area. This would constitute an above average situation that someone will do something that would require more than just a first aid kit to stabilize a trauma injury sustained while getting your area ready for use. This rushing sometimes can’t be helped with whatever is going on around you. Most injuries would occur within the first 48 hrs during bugging out. Thank you Rick, I appreciate your prospective. I too was a firefighter/medic however only for 22 years. I need to revamp my first aid kit more oriented towards trauma. I agree that like you say most injuries will likely occur within the first 48 hours of bugging out. You got a great kit there. You might consider an axe or at least a hatchet to help process firewood in the event that you would end up in the woods and need a campfire for boiling water, cooking food, drying clothing, or providing heat for your body and to repel certain critters. Thank you, since writing this post I have had two other renditions of a BOB. My current one is actually what I consider a get home bag/72 hour bag. This one has an axe as well as sleeping bag, thin air mattress and solo backpacking tent. I value your input and others should consider it as well.